I took some of the strangest things when my Grandma passed. Some she gave to me when she was first diagnosed with cancer because she wanted to be sure that I got them. To an outsider, they would have seemed silly. An old tin pressure juicer, an old church pew, a dilapidated picture of poppies, a free standing mirror and her buttons. The juicer was legit, man! There is no better citrus juicer to this day. All the technology and gadgets that have come since it’s inception and this one still beats them all. The pew… I just love it. It’s got a patchwork quilt seat cushion that she made and it’s in my sitting area on my porch. I had the frame around the poppies fixed and it’s hung in my bedroom next to the mirror. But, buttons??? Why in hell would I want the buttons? Because I spent hours upon hours as a child playing with them. 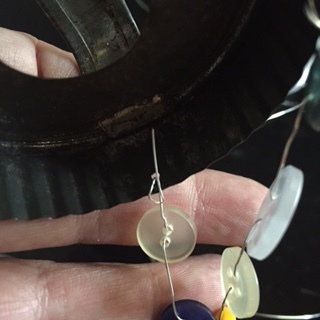 They were money, they were dolly food, they got threaded onto elastic and made into jewelry… I LOVE my gramma’s buttons. My other Grandma gave me equally random items when she downsized her living space. A depression glass pitcher, a cheap old cut glass powder jar, some really interesting carved copper and silver plates and a menagerie of cookie and biscuit cutters. Unfortunately, the pitcher got broken, but the powder jar is on my vanity, the plates are hung on my kitchen wall and the cutters have gotten some use. However, today I did something very cool with them. This will make me happy for years to come. 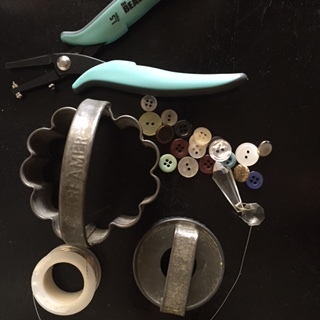 I decided to take two of the biscuit cutters and 48 (to be exact) buttons and make something cool. 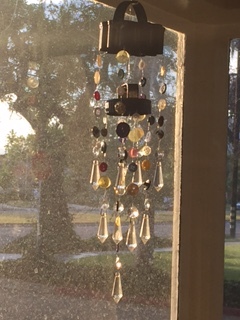 I used one small and one large biscuit cutter to make the beginning of my little chandelier sun catcher. 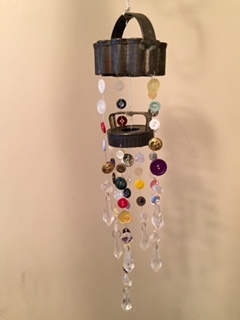 I used 28 gage silver wire and a handful of found chandelier type crystals that I was saving for a rainy day. 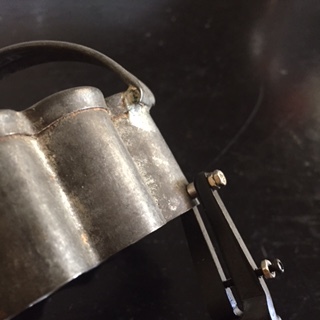 The tools I used were a metal punch and needle nosed pliers. First, I punched four holes in each cutter. The were evenly spaced in quarters around the edge. 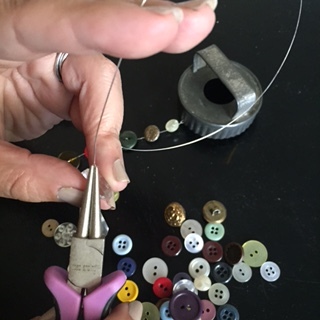 Next, attached lengths of wire first to the crystals and then threaded the buttons on evenly, leaving about two inches on the end for fastening to the cutters. I used five buttons on each of the outer strands. 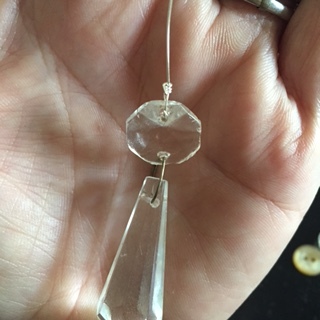 I made one longer strand with eight buttons and left extra wire on the end opposite the crystal. Once I had nine strands, I fastened each to it’s respective hole and wrapped them sufficiently. 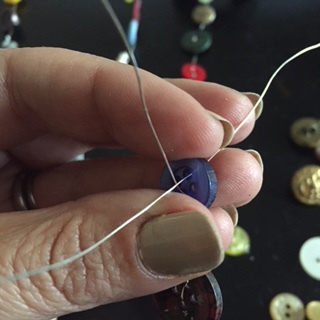 the longest strand was then attached to the middle of the handle on the small cutter, wrapped tightly, end trimmed. I then took another length of wire and connected the small cutter to the handle of the large cutter. Lastly, I made a little twist of wire and created a hanging loop which I then wrapped around the center of the handle of the large cutter. Once all my wire ends had been safely snipped and twisted, I hung in in my kitchen window… and I didn’t even care that my windows were dirty.